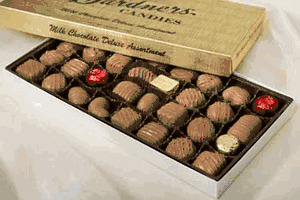 What can we really say about this 1-pound box of Gardner’s assorted chocolates? The perfect old-fashioned Christmas candy, the box contains a lovely collection of 32 mouthwatering chocolate candies, including in fruit cream, coconut, nutty, peanut butter meltaway, and caramel flavorings. Of course, milk chocolate permeates it all, as well. These candies will make great additions to your Christmas candy buffets this year. You’ll want to give the gift of class this Christmas with Gardner’s assorted chocolates, available in 8-ounce, 1-pound, and 2-pound varieties. For all your Christmas candy in bulk, keep it with Blair Candy!